T-Mobile released a new app to Google Play this morning, one which will let compatible device owners SIM unlock their phones, allowing them to use the device on another supported network. As of right now, Device Unlock is only compatible with the Galaxy Avant, but support for additional devices could come down the road. Upon opening the app on a supported device, you will be met with two options. Request for a permanent unlock and request for temporary unlock. The temporary unlock is used when a customer would like to take their phone out of the country, at which point they can use a local carrier’s SIM to make and receive calls. The permanent option allows for customers completely rid themselves of carrier ties, allowing the phone to work on any compatible network going forward. 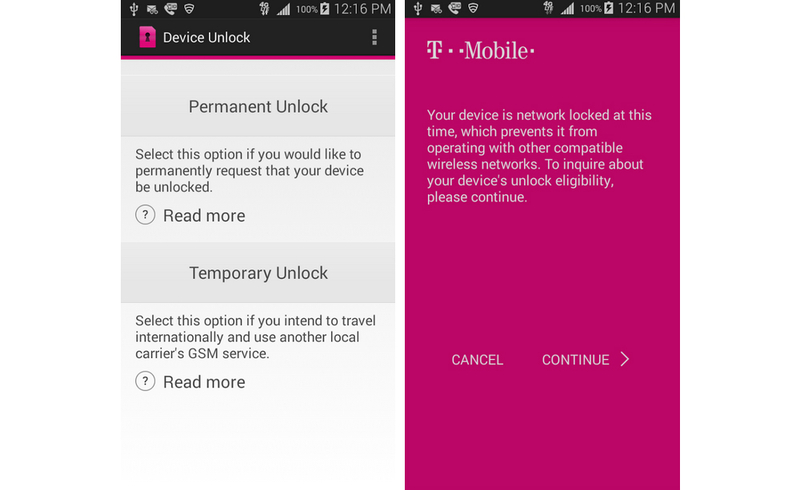 We think this is a pretty sweet move by T-Mobile, but again, it’s an app that requests an unlock. You still have to go through T-Mobile to get those requests granted. As mentioned, it is only available for the Galaxy Avant, but support for additional devices could come down the road. T-Mobile customers, go check it out.